It seems I like exotic skins. Who knew? This is the latest in a long line of posts about bags made in exotic skins. For some reason I have been gravitating towards bags in exotic skins lately. To me, they seem luxurious and glamorous. And really, they are because they come with an efty price tag. 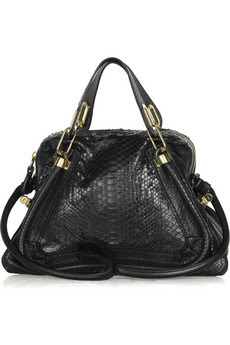 I am loving this Chole Paraty python bag. I love the shape and the way the bag slouches. It is a mix of structure and relaxed python skin. I also love the top handles and the gold hardware, and the additional strap hanging off the side. It gives you two ways to wear the bag and adds a little something extra when you are using the top handles. 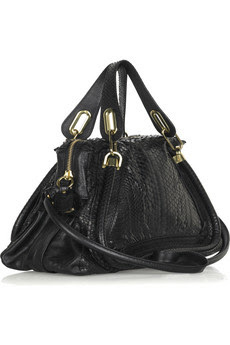 The star of the bag is the python skin and I love the way it shines and shows of how luxurious this bag is. There is a spot waiting for it in my closet. Sadly, I will be waiting a while. it is gorge. i also love the petal to the metal marc jacobs bad, though unless leather is now exotic its not really in the same vein.